It’s been an intense week of concept arts and prototyping for the Prediction Error team. Our art team met on Friday evening to discuss aesthetics. They assembled moodboards, discussed art style, specific requirements for concept art to be finished this week, and worked the rest of the week on creating concepts and making sure the whole team was aware of the visual direction for the project. Pinterest boards created by the art team. Programmers (and Chris) were hard at work on crafting tech demos and prototypes to be shown in Tuesday’s public pitch. Chris completed a demo for our camera mechanic, which both ‘takes’ pictures and recognizes the objects in front of it. Samara inegrated her database work into Unity and set up a complete conversation interaction with two separate conversations. Erin worked to blend these prototypes into one scene. This is in preparation for a complete greybox with all interactions included – the camera and conversation this week, plus one prototype puzzle, teleportation around the room, and a murder board for next week. 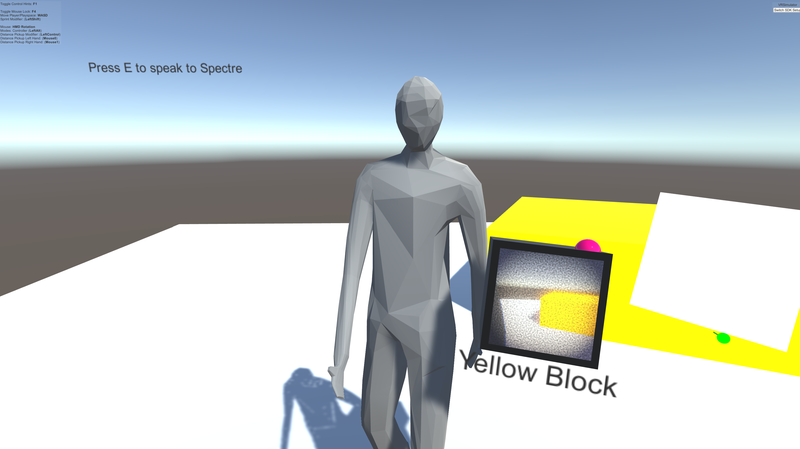 Samara’s conversation prototype (which also includes a second conversation if the player walks away and returns). On Monday, our team sat down with Dr. Frank Lee to discuss lessons learned from last year’s project Shadow of a Doubt, so we may avoid some of the pitfalls that team ran into. Corey Arnold, Program Manager for the Entrepreneurial Game Studio, was also present in the meeting and helped the team a great deal. We discussed the shortcomings of many senior projects: organization, project management, and having someone there to make final decisions. We also talked about why we were working in VR instead of other mediums. Dr. Lee stressed the importance of creating visceral emotional experiences, especially when it comes to VR, and suggested some other ideas as examples of what we could do. Corey, also present at the meeting, facilitated plot discussion. He explained that if we were going for high emotional reactions to situations, a detective is the cool detached persona and might not evoke the reaction we want in the player. He also suggested that we think about having the body of the victim in the room with the player. We left the meeting with several ideas on how to improve the player’s experience in our story, and how to continue to scope down to manageable level. Finally, the team and leads spent time refining the new narrative idea and preparing for our second public pitch on October 16th. Next week, we’re looking forward to lots of new concept art, a GDD overhaul, new mechanic prototypes, and a full greyboxed room with all these interactions! Here’s a camera mechanic that Chris prototyped. I worked this week to bring it into the same scene as Samara’s conversation prototype (seen with the stand-in humanoid), and did video capture of both for inclusion in our pitch deck. Positives: It’s been really nice to dig my hands into the project as a whole this week. I had an exciting time pulling Chris and Samara’s hard prototyping work into a single project, and it’s wonderful to see a really solid showcase of all of our mechanics start to come together. Getting to attach the Polaroid camera to the same object that sparks interactions made it finally feel like all of the individual work we’ve been doing feeds into one whole. 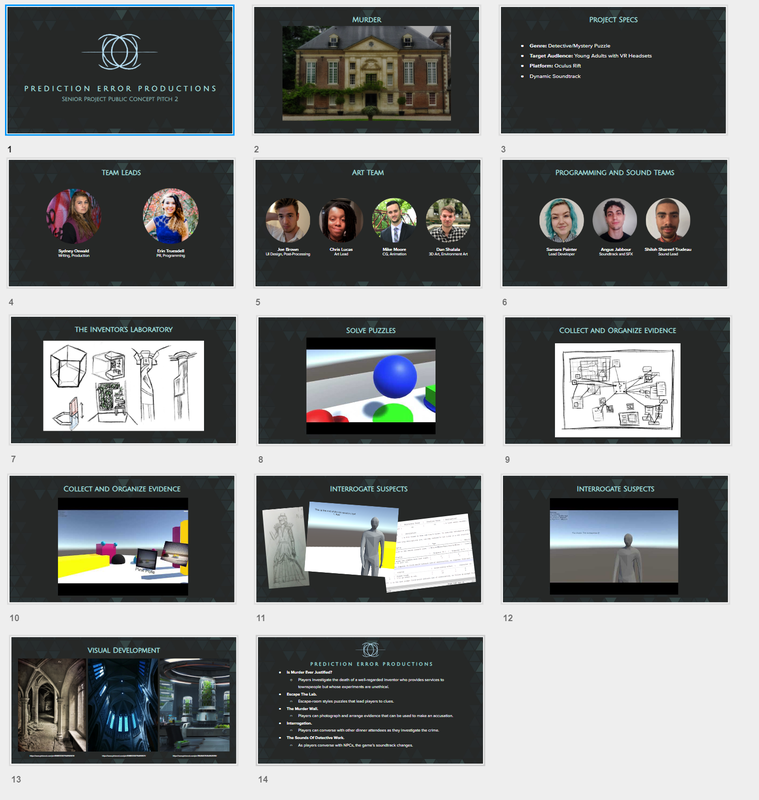 Additionally, I got to work on our second public pitch deck, which helped both me and the team solidify our plans for the new direction. It’s so validating to be able to show off our technical skills to the world and introduce our new direction! Conversation and camera in the same scene. Negatives: EVERYTHING BROKE. And never at opportune times. I was all set to go to a fraternity event in a dress and heels when our TechDemos branch (which contained the work of Samara, Chris, and me) suddenly had seemingly endless merge conflicts and the project broke the compiler. Nothing like endlessly pushing and pulling when you’ve got somewhere to be. Fortunately, I was able to get the issue resolved before I left the house so Chris and Samara could complete their projects in a functional Unity file. Finally, working to begin bringing the prototypes together felt excellent, but the VRTK hand controls in the scene no longer work. However, I had to give up on fixing that for this week in order to make sure all of our team deliverables got done and submitted. Finally, the whole team this week struggled with clearly communicating deadlines – I didn’t have materials I needed when I needed them, so a major point to improve on in the upcoming week is delineating very clear times and dates when tasks need to be finished and sent to those who need them. These tasks took me off of the puzzle prototype I had planned to work on this week. Positives: And we are in full swing! we have discussed at length what we wanted to do with the game and had a wonderful meeting about what we wanted to do for character design. I have a wealth of different resources to help me on this process and have plenty of ideas due to the wonderful inspiration that the art team came up with during our meeting. I feel much more comfortable with this idea, as cybernetics and the like are things that I think are really interesting and cool. I say this because they feature heavily with our character design. Negatives: I wasn’t able to get as much done as I wanted to this weekend for concept art. Time management is going to be a large thing that I will need to focus on in the future. Positives: Our master branch project is now updated to use the newest version of Unity, which the team has been utilizing to create prototypes. I did a bit of research to look into using a SQLite database with a Unity project, and luckily it turned out to be rather easy to add. I was able to incorporate a database into a test branch, and use that database to store dialogue for a conversation in a prototype scene (shown below). Even if we decide to move away from the original conversation logic we mapped out earlier in the term, a database will be useful to store character information, clues, and other items we might need for the game, including the current state of those items. 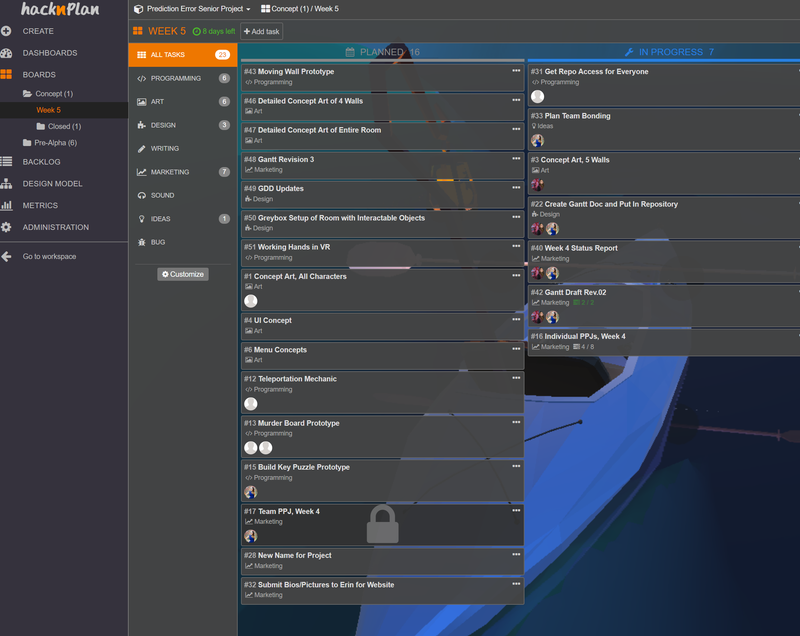 The prototype I created both grabs data from the database, and updates data values in the database, which should take care of all the base-level database interactions we might need for this project. Negatives: The whole team still does not have access to the GitHub repository, so I am working to get that completed. Additionally, the code I created for the conversation prototype, while functioning, will need to be cleaned and separated into more general scripts before it should be incorporated into the master branch. 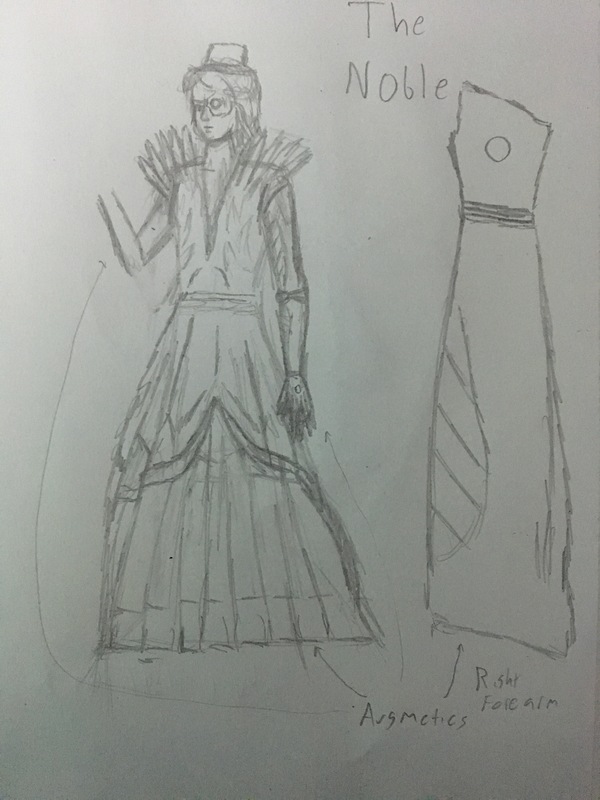 Positives: After having a good long discussion with the rest of the artists on the team about aesthetic, we found we all agreed on a futuristic but Gothic look for the game. A few Pinterest boards later and we all set off to do concept art for different things. 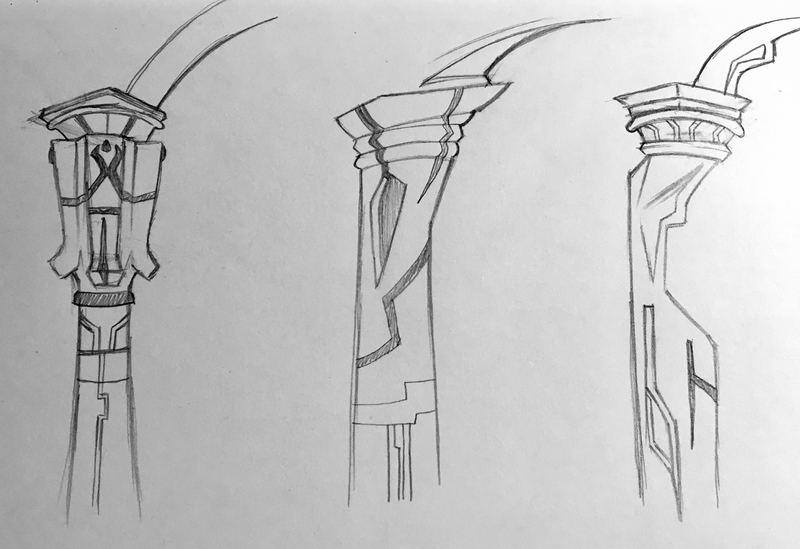 I worked specifically on how to combine Gothic and Brutalist architecture designs by drawing pillars with different levels of accents and light paths. Next I drew some super basic layouts of the room we talked about, and how the wall modules will be able to switch places by sliding up or down. This will let us add walls if we have time to make more assets. 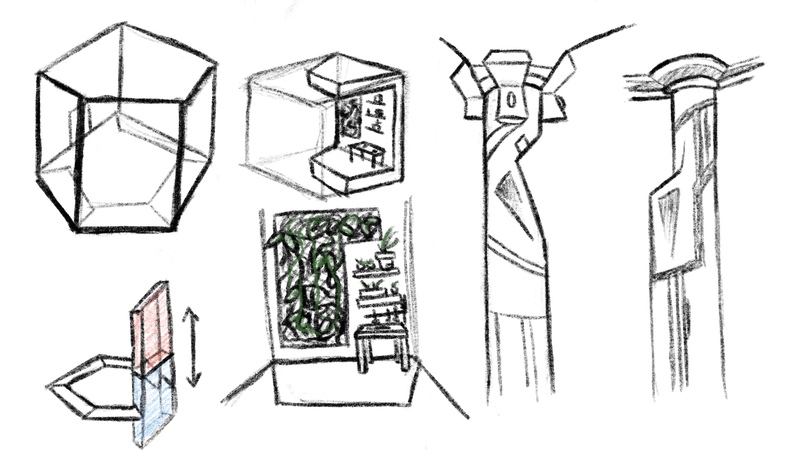 I also sketched up a small bio room to show what a wall module would look like. Negatives: We haven’t had a discussion about specific walls yet, so I wasn’t sure what exactly we wanted drawn up. In this next week I want to draw out in-depth concepts for each of the 4 walls and have a extensive drawing of the pentagonal room itself.